Designs by Lisa Somerville: La-de-dah! There's something about that cute little critter that brings a smile to my face! The background was created using the Ink and Roll Technique from the February Technique Junkie Newsletter (all stamps from Stampotique). 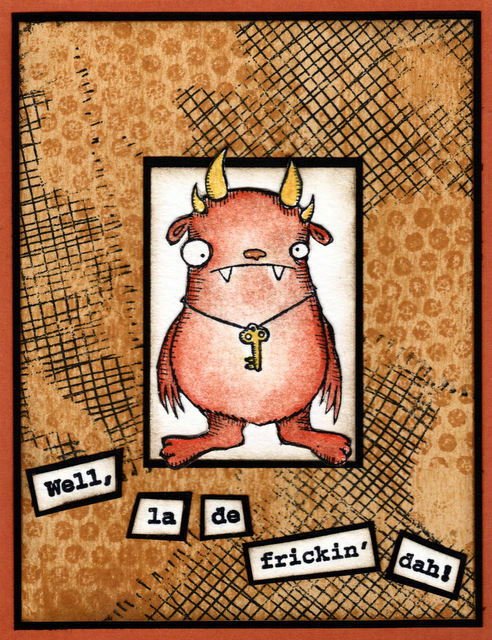 The little monster is stamped in Ranger Black Archival on Watercolor paper and colored with STAEDTLER Karat Aquarell Watercolor Pencils and blended with Gamsol. The image was cut so he'd be slightly out of the box. Thanks so much to those who left a comment on my Gelli Arts Plate giveaway! I had the random number generator select the winner. Love your project! The gelli art plate looks like fun! Congrats Ocean Avenue Silks! Please email me by Feb. 26th to claim your prize! This card is hilarious and cute!!! I keep wondering who would be the recipient...lol!!! I love that little critter too...just great! Love the way he's coming out of the box and that sentiment is hilarious! OMG, this is fabulous ... LOVE the terrific image and sentiment!! he he, love him! very cute and love how you have him out of the box just a little. Too funny! 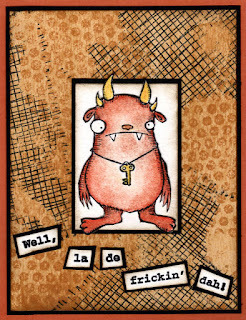 Cool background and your monster is funky! lmao, just too funny.....luv those little horns poing thru.